Background: Acupuncture is applied worldwide in treating hot flashes (HFs), which may be a common complication experienced by women with breast cancer (BC). Although researches associated with the effect of acupuncture for HFs have been done by many people, there is a lack of comprehensive evaluation of the effect of this therapy. Objective: The aim of this systematic review is to assess the effectiveness of acupuncture for HFs in women with BC. Methods: Seven databases (Cochrane Central Register of Controlled Trials, Embase, PubMed, Web of Science, Chinese National Knowledge Infrastructure Database, Chinese Biomedical Literature Database, and Wan Fang Database) were searched from their inceptions to June 2015 without language restrictions. Randomized controlled trials (RCTs) were aggregated to evaluate the therapeutic effect of acupuncture for HFs in women with BC. Results: Twelve RCTs were identified at last, and all of the studies agreed on the potential therapeutic effect of acupuncture for HFs in women with BC. However, three trials showed significant difference compared with the controls. One research demonstrated an encouraging trend, and six did not find any difference between acupuncture and controls. Another two trials got a negative result compared with hormone therapy. The meta-analysis indicated a difference in the number of HFs after treatment and during follow-up compared with the controls. Three trials reported Kupperman index scores, and meta-analysis showed significant difference between acupuncture and controls after treatment and during follow-up. Conclusion: Acupuncture seems to be an effective therapy for HFs in women with BC; however, there was insufficient evidence to support the efficacy of acupuncture. However, the results should be interpreted cautiously, because of the poor quality and small number of included studies. Hot flashes (HFs) are described as episodic sensations of heat, intense sweating, flashing affecting the face and chest, and always accompanied by palpitations and anxiety.,, This symptom may last for 3–10 min and usually occurs with varying frequency., Some patients even experience HFs hourly or daily, and almost two-thirds of the patients report that HFs decrease their quality-of-life.,, HFs are common and detrimental adverse effects in women with breast cancer (BC). Any reason that can cause rapid estrogen withdrawal could have an influence on the onset or worsening of HFs in women with BC, such as cancer therapies (oophorectomy, chemotherapy, and endocrine therapies), menopausal status.,,,, It is understood that 65% BC survivors experience HFs due to the treatment of BC.,,, Up to now, many randomized trials do not show any clinically meaningful effects of soy phytoestrogens,,, red clover,, or black cohosh ,, for HFs. Vitamin E only produces a small positive effect for HFs., Thus, clinicians and patients begin to focus their attention on complementary and alternative therapies to find a new way to harmonize this manifestation. Acupuncture, though the mechanism is still unclear, has been reported as a supporting and palliative care for HFs in cancer patients.,, Actually, there have been some reviews analyzing the therapeutic effect of acupuncture for HFs in patients with BC,, but no positive conclusions are available. Our review aims at making an update. Trials were searched using seven databases (Cochrane Central Register of Controlled Trials, Embase, PubMed, Web of Science, Chinese National Knowledge Infrastructure Database, Chinese Biomedical Literature Database, and Wan Fang Database) from their inceptions to June 2015. Search terms used were as follows: “Acupuncture” or “electro-acupuncture” or “needle” or “acupuncture point” or “acupoint” or “acupuncture treatment” or “acupuncture therapy” or “meridian” and “BC” or “breast carcinoma” or “breast tumor,” and “HFs” or “hot flushes.” Hardcopies of all articles were obtained manually and read fully. (1) Only randomized controlled trials (RCTs) labeled the intervention “acupuncture,” such as traditional acupuncture, electro-acupuncture, ear-acupuncture, self-acupuncture, and injection acupuncture were included in this systematic review. Observational, cohort, case–control, case series, qualitative studies, uncontrolled trials, and laboratory studies were excluded. (2) Patients who accepted acupuncture as the main treatment or an adjunct to other treatment for HFs (if the control group also received the same concomitant treatment as the acupuncture group) were employed. (3) The control could be sham acupuncture (SA), nonacupoint acupuncture, relaxation, or some other ways (such as Western medicine). Dissertations and abstracts were also included. (4) Trials were included only when the outcome measurement is relevant to HFs in women with BC. The primary outcome was the number or frequency of HFs after treatment and during follow-up, and the second outcome could be improvement of the quality-of-life measured by validated scores such as Kupperman index (KI). (5) It was ineligible if only immunological or biological parameters were estimated. Language restrictions were not imposed. The selection process is listed in [Figure 1]. All articles were read by two independent reviewers (Chen and Peng), and data from the articles were validated and extracted based on the predefined criteria. No language limitations were exerted. The risk of bias was assessed using the assessment tool for “risk of bias” from the Cochrane Handbook for Systematic Reviews of Interventions. The following characteristics were assessed: (1) Was the allocation sequence adequately generated? (2) Was the allocation adequately concealed? (3) Was knowledge of the allocated interventions adequately presented during the study? (4) Were incomplete outcome data adequately addressed? (5) Were the study reports have selective outcome reporting? (6) Was the study free of other problems that could put it at a risk of bias? Our review used “L, U, and H” as keys for the judgments: “Low” (L) indicated a low risk of bias, “unclear” (U) indicated that a risk of bias was uncertain, and “high” (H) indicated a high risk of bias. Given that blinding therapists to the use of acupuncture is out of question, the patient and assessor blinding were assessed separately. Disagreements were resolved by the third reviewer (Liu). Outcome data were summarized using risk ratio with 95% confidence intervals (95% CI) for binary outcomes or mean difference (MD) with 95% CI for continuous outcomes. RevMan 5.0.20 software (Cochrane Database of Systematic Reviews) was used for data analyses. Meta-analysis was used if the trials had good homogeneity, which was assessed by examining I2 (an index that describes the percentage of variation across the studies that is due to heterogeneity rather than chance) on study design, participants, interventions, control, and outcome measures. Funnel plot analysis was done to determine publication bias if feasible. One hundred forty-nine hits have generated with the search methods and 12 articles ,,,,,,,,,,, met our inclusion criteria. 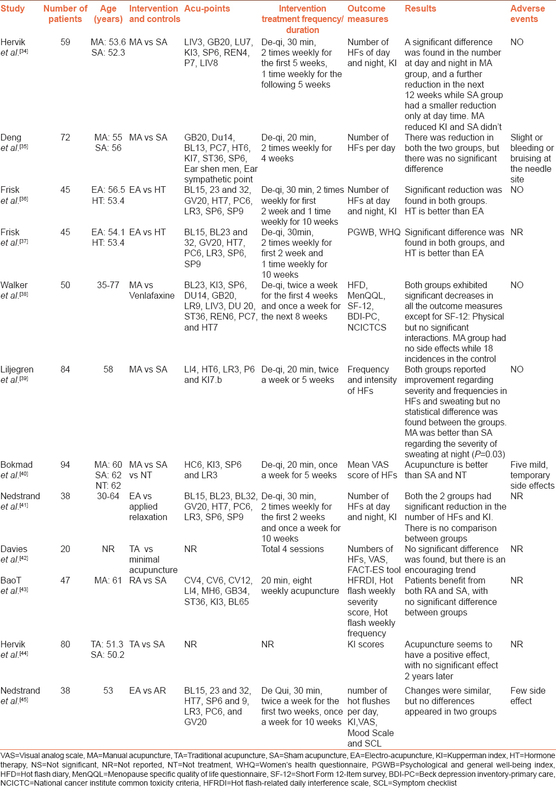 The key data of the included RCTs are listed in [Table 1] and [Table 2]. Six hundred seventy-two women with BC were involved in 12 prospective RCTs. In nine ,,,,,,,, trials, the mean age is 52-62 years. One  study did not mention the mean age and the age gap in another two , studies was a little big, ranging from 30 to 77. The sample size was ranged from 20 to 94. The reason of HFs did not clearly described in the included RCTs, except participants in four ,,, trials were complaining HFs because of the use of tamoxifen. Interventions included manual acupuncture and electro-acupuncture while controls varied considerably. Seven ,,,,,, trials applied SA, ,,,, of which five were applied on nonacupoints away from the real, while one  used the middle point between two real acupoints and another one  without detailed information. Among the seven SA groups, three ,, used superficial insert, three ,, applied no penetration with special needle, and another trial  gave no information about this. Two , trials adopt hormone therapy (HT) and one  employed medication (venlafaxine). Two , studies made applied relaxation, which consisted of progressive relaxation, release-only relaxation, cue-controlled relaxation, differential relaxation, rapid relaxation, application training, and maintenance program as the control. Six ,,,,,[q45] RCTs reported number of HFs a day as the primary outcome and four ,,, of them reported KI at the same time. One  trial just reported KI scores. Frequency or intensity/severity of HFs was revealed in two , RCTs. All of the RCTs show therapeutic effect of acupuncture. However, of the six ,, [39,,, trials comparing acupuncture with SA, only two , get significant difference between intervention and control groups, other four ,,, reach no statistical significance. Two , studies indicate negative difference for acupuncture comparing with HT. Acupuncture group appears to be equivalent to drug therapy (venlafaxine). As to applied relaxation, no statistic compare could be seen in two , articles. Two , trials reported slight bleeding or bruising at the needle site. A total of 14 (15%) participants with fatigue, pruritus, and nausea were reported in one  trial. In 12 studies, four ,,, claimed the methods of randomization clearly, namely computer-generated randomization table while eight ,,,,,,, did not clearly described how the random adequate sequences were generated. Only seven ,,,,,, trials reported the allocated concealment method clearly. Hervik and Mjåland  used a sealed envelope technique and Deng et al. achieved the concealment by cancer central of the trial. Five ,,, had no specific statement and the other one  without concealing. One  trial performed blinding just for patients while another six ,,,,, for the patients and investigator or outcome assessor. It is unclear in the other articles. Only one  trial was found unclear on the risk of the incomplete outcome data and selective outcome reporting. The trials were with no other sources of bias. Data were not available in two , trials, so nine ,,,,,,,, trials were included for analysis. For 1 trial that was a cross-over design, we just chose the data before cross-over. Six ,,,,, trials reported the number or frequency of HFs after treatment, and meta-analysis indicated that acupuncture was superior to controls [MD, −1.52, 95% CI: −2.47–−0.58, P = 0.002, [Figure 2]. Five ,,,, trials reported the number or frequency of HFs during follow-up, and meta-analysis showed that acupuncture was better than controls [MD, −1.32, 95% CI: −2.19–−0.46, P = 0.003, [Figure 3]. Two , trials were not included in this meta-analysis because interquartile range was used in the result analysis, and the sample was too small to convert into MD. Three ,, trials reported KI scores, and meta-analysis showed significant difference between acupuncture and controls after treatment [MD, −3.34, 95% CI: −3.60 − 3.07, P < 0.00001, [Figure 4] and during follow-up [MD, −2.55, 95% CI: −2.77–−2.34, P < 0.00001, [Figure 5]. One  trial found a significant positive effect on sleep in the acupuncture group compared with the SA and no-treatment groups after treatment. One  trial reached an equivalent effect between acupuncture and HT in term with health-related quality-of-life and sleep. One  trial found no difference between acupuncture and applied relaxation on psychological well-being and mood. A funnel plot analysis is not eligible due to the insufficient number. 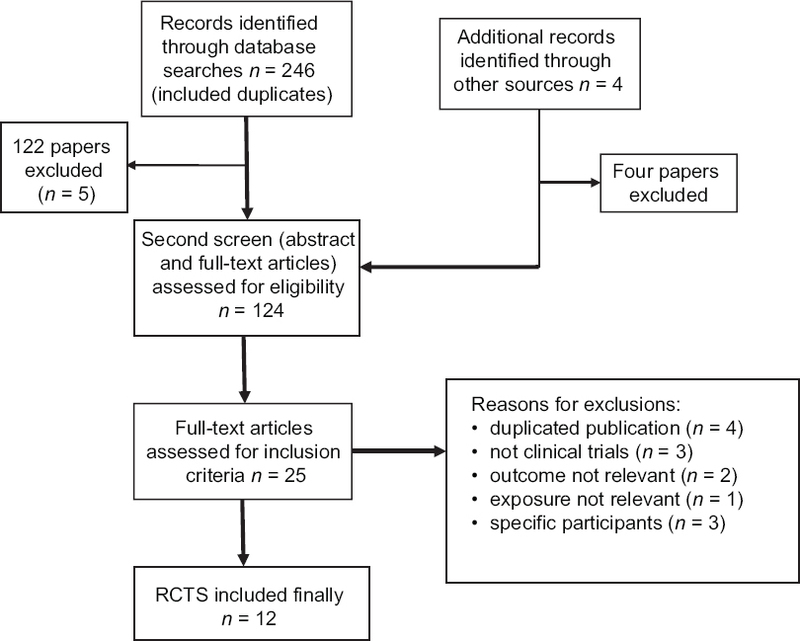 This systematic review identifies very few rigorous RCTs testing the effectiveness of acupuncture for HFs in women with BC. Of the 12 RCTs, all of them agree on the effect of acupuncture to improve HFs symptoms. Three ,, trials showed significant difference compared with the controls, one  research just demonstrated an encouraging trend, and six ,,,,, did not find any difference between acupuncture and controls. Another two , trials got a negative result compared with HT. Our analysis gets positive results in terms with the number of HFs and KI scores on the time after treatment and during follow-up in women with BC. Compared with the most recent review by Frisk et al., we found that acupuncture might be an effective way in reducing the number of HFs and improving the quality-of-life in women with BC. Hence, many methods were used to assess the therapeutic effectiveness of HFs in women with BC, but most of reviews used frequency of HFs as the measurement.,, Unlike them, number of HFs and KI of women with BC were extracted to analyze in this review. Number of HFs would measure the acupuncture effect the same as the frequency of HFs and KI was established in clinical practice which would indicate the quality of women's life from a multidimensional view including physiological, psychological, and social aspects. Hence, the improvement of HFs in women with BC can be well-evaluated from the angle of number of HFs and KI. Considering the limitations and side effects of conventional therapies, HFs are proved to be different to manipulate in women with BC. In addition, the majority of the reasons should be responsible for HFs in women with BC, which accelerated the difficulty to treat HFs. HFs in women with BC may occur as natural climacteric phenomena. They may also result from recommended discontinuation of hormone replacement therapy or as a result of adjuvant treatments for BC such as cytotoxic chemotherapy and selective estrogen-receptor modulator. Even so, as a traditional Chinese method, acupuncture possesses its unique therapeutic principles and makes it possible to overcome HFs. From the perspective of traditional Chinese medicine, HFs may be induced by deficiency of yin and qi in postmenopausal or menopausal women, especially kidney yin deficiency., However, in the theoretical system of acupuncture and moxibustion, acupuncture can regulate and replenish yin, yang, qi, and blood of the body, which may be the reason that acupuncture can alleviate and treat HFs in women with BC. However, acupuncture can evoke complex somatic-sensory sensations and may modulate the function of the body through the brain and extending central nervous system networks. Huang et al. present that the mechanism of acupuncture regulates visceral sensation from the relationship between meridians and viscera. Spetz Holm et al. explained that acupuncture can increase estrogen or release calcitonin gene-related peptide, which was effective to reduce HFs. Walker et al. and Hervik and Mjåland  proved that acupuncture may reduce HFs in women with BC with fewer side effects than conventional pharmacologic therapies. In this review, two , trials definitely pointed out that acupuncture had no side effect and one  even had additional beneficial. Hence, though lack of evidence, acupuncture is bounded to be chosen by BC patients to administrate HFs, and it will win more attention. The risk of bias in the studies was assessed based on the descriptions of adequate sequence generation, blinding, incomplete outcome data, selective outcome reporting, allocation concealment, and other sources of bias. Most of the studies suffered a relatively high-risk of bias. Seven ,,,,,, RCTs reported the allocation concealment and the others did not describe that, which led to exclusion or high risk of bias. Six ,,,,, RCTs employed the double-blinded methods of patient-investigator, one  trial made an attempt to blind patients, and the blind methods were unclear in the other RCTs. Though the acupuncturist could not be blinded, it was necessary to blind patients and as well as the investigator who was responsible for the data collection and evaluation was possible to achieve. Thus, the reliability of the evidence presented is clearly limited. In addition, though the model of SA is tested and has been widely applied, there is still some debate about it from the perspective of meridian theory. However, another debated question is the homogeneity of the participant in the included RCTs. (1) Reasons of HFs did not clearly describe in this review. First, patients in nine ,,,,,,, trials had finished treatment (primary surgery and/or undergoing corresponding auxiliary therapy) and the detailed information in other three ,, trials were unknown. Second, tamoxifen played an important role in anti-estrogen therapy and was associated with the side effect of HFs caused by estrogen deficiency.,, Although participants in four ,,, trials used tamoxifen, just one  trial got a positive result and the other three did not get the similar positive conclusion. It was difficult to analyze the connection between the anti-estrogen therapy and the effect of acupuncture for HFs. (2) In this review, the women BC patients in postmenopause condition in three ,, trials, two , of them got significant difference compared with the control groups, though the link between the effect of acupuncture for HFs and the menopause status of the BC patients could not definitely acquire. (3) Due to the incomplete information and different standard of the limits of the number/severity of HFs of the participants, the relationship between the improvement and the baseline of HFs in the patients could not be obtained. Further resolution is needed to minimize the risk and acquire a convincing result. Acupuncture seems to be an effective therapy to reduce HFs in women with BC and improve BC women's quality-of-life; however, there was insufficient evidence to support the efficacy of acupuncture. However, the results should be interpreted cautiously, because of the poor quality and small number of included studies. The authors would like to thank all the people involved in this process. Dalal S, Zhukovsky DS. Pathophysiology and management of hot flashes. J Support Oncol 2006;4:315-2025. Pachman DR, Jones JM, Loprinzi CL. Management of menopause-associated vasomotor symptoms: Current treatment options, challenges and future directions. Int J Womens Health 2010;2:123. Couzi RJ, Helzlsouer KJ, Fetting JH. Prevalence of menopausal symptoms among women with a history of breast cancer and attitudes toward estrogen replacement therapy. J Clin Oncol 1995;13:2737-44. Avis NE, Brockwell S, Colvin A. A universal menopausal syndrome? Am J Med 2005;118 Suppl 12B: 37-46. Bień A, Rzońca E, Iwanowicz-Palus G, Pańczyk-Szeptuch M. The influence of climacteric symptoms on women's lives and activities. Int J Environ Res Public Health 2015;12:3835-46. Ganz PA. Menopause and breast cancer: Symptoms, late effects, and their management. Semin Oncol 2001;28:274-83. Carpenter JS, Johnson D, Wagner L, Andrykowski M. Hot flashes and related outcomes in breast cancer survivors and matched comparison women. Oncol Nurs Forum 2002;29:E16-25. Tchen N, Juffs HG, Downie FP, Yi QL, Hu H, Chemerynsky I, et al. Cognitive function, fatigue, and menopausal symptoms in women receiving chemotherapy for breast cancer. J Clin Oncol 2003;21:4175-83. Savard J, Davidson JR, Ivers H, Quesnel C, Rioux D, Dupéré V, et al. The association between nocturnal hot flashes and sleep in breast cancer survivors. J Pain Symptom Manage 2004;27:513-22. Goodwin PJ, Ennis M, Pritchard KI, McCready D, Koo J, Sidlofsky S, et al. Adjuvant treatment and onset of menopause predict weight gain after breast cancer diagnosis. J Clin Oncol 1999;17:120-9. Guimond AJ, Massicotte E, Savard MH, Charron-Drolet J, Ruel S, Ivers H, et al. Is anxiety associated with hot flashes in women with breast cancer? Menopause 2015;22:864-71. Bordeleau L, Pritchard K, Goodwin P, Loprinzi C. Therapeutic options for the management of hot flashes in breast cancer survivors: An evidence-based review. Clin Ther 2007;29:230-41. David SM, Salzillo S, Bowe P, Scuncio S, Malit B, Raker C, et al. Randomised controlled trial comparing hypnotherapy versus gabapentin for the treatment of hot flashes in breast cancer survivors: A pilot study. BMJ Open 2013;3:e003138. Mao JJ, Leed R, Bowman MA, Desai K, Bramble M, Armstrong K, et al. Acupuncture for hot flashes: Decision making by breast cancer survivors. J Am Board Fam Med 2012;25:323-32. Albertazzi P, Steel SA, Bottazzi M. Effect of pure genistein on bone markers and hot flushes. Climacteric 2005;8:371-9. Lewis JE, Nickell LA, Thompson LU, Szalai JP, Kiss A, Hilditch JR. A randomized controlled trial of the effect of dietary soy and flaxseed muffins on quality of life and hot flashes during menopause. Menopause 2006;13:631-42. Verhoeven MO, van der Mooren MJ, van de Weijer PH, Verdegem PJ, van der Burgt LM, Kenemans P; CuraTrial Research Group. Effect of a combination of isoflavones and Actaea racemosa Linnaeus on climacteric symptoms in healthy symptomatic perimenopausal women: A 12-week randomized, placebo-controlled, double-blind study. Menopause 2005;12:412-20. Tice JA, Ettinger B, Ensrud K, Wallace R, Blackwell T, Cummings SR. Phytoestrogen supplements for the treatment of hot flashes: The Isoflavone Clover Extract (ICE) Study: A randomized controlled trial. JAMA 2003;290:207-14. Fisher WI, Johnson AK, Elkins GR, Otte JL, Burns DS, Yu M, et al. Risk factors, pathophysiology, and treatment of hot flashes in cancer. CA Cancer J Clin 2013;63:167-92. Pockaj BA, Gallagher JG, Loprinzi CL, Stella PJ, Barton DL, Sloan JA, et al. Phase III double-blind, randomized, placebo-controlled crossover trial of black cohosh in the management of hot flashes: NCCTG Trial N01CC1. J Clin Oncol 2006;24:2836-41. Jacobson JS, Troxel AB, Evans J, Klaus L, Vahdat L, Kinne D, et al. Randomized trial of black cohosh for the treatment of hot flashes among women with a history of breast cancer. J Clin Oncol 2001;19:2739-45. Newton KM, Reed SD, LaCroix AZ, Grothaus LC, Ehrlich K, Guiltinan J. Treatment of vasomotor symptoms of menopause with black cohosh, multibotanicals, soy, hormone therapy, or placebo: A randomized trial. Ann Intern Med 2006;145:869-79. Biglia N, Sgandurra P, Peano E, Marenco D, Moggio G, Bounous V, et al. Non-hormonal treatment of hot flushes in breast cancer survivors: Gabapentin vs. Vitamin E. Climacteric 2009;12:310-8. Beer TM, Benavides M, Emmons SL, Hayes M, Liu G, Garzotto M, et al. Acupuncture for hot flashes in patients with prostate cancer. Urology 2010;76:1182-8. Frisk J, Spetz AC, Hjertberg H, Petersson B, Hammar M. Two modes of acupuncture as a treatment for hot flushes in men with prostate cancer – a prospective multicenter study with long-term follow-up. Eur Urol 2009;55:156-63. Hammar M, Frisk J, Grimås O, Höök M, Spetz AC, Wyon Y. Acupuncture treatment of vasomotor symptoms in men with prostatic carcinoma: A pilot study. J Urol 1999;161:853-6. Lee MS, Kim KH, Choi SM, Ernst E. Acupuncture for treating hot flashes in breast cancer patients: A systematic review. Breast Cancer Res Treat 2009;115:497-503. Jeong YJ, Park YS, Kwon HJ, Shin IH, Bong JG, Park SH. Acupuncture for the treatment of hot flashes in patients with breast cancer receiving antiestrogen therapy: A pilot study in Korean women. J Altern Complement Med 2013;19:690-6. Higgins J P T. Green S. Cochrane handbook for systematic reviews of interventions version 5.1.0[J]. The Cochrane Collaboration 2011;5. Hervik J, Mjåland O. Acupuncture for the treatment of hot flashes in breast cancer patients, a randomized, controlled trial. Breast Cancer Res Treat 2009;116:311-6. Deng G, Vickers A, Yeung S, D'Andrea GM, Xiao H, Heerdt AS, et al. Randomized, controlled trial of acupuncture for the treatment of hot flashes in breast cancer patients. J Clin Oncol 2007;25:5584-90. Frisk J, Carlhäll S, Källström AC, Lindh-Astrand L, Malmström A, Hammar M. Long-term follow-up of acupuncture and hormone therapy on hot flushes in women with breast cancer: A prospective, randomized, controlled multicenter trial. Climacteric 2008;11:166-74. Frisk J, Källström AC, Wall N, Fredrikson M, Hammar M. Acupuncture improves health-related quality-of-life (HRQoL) and sleep in women with breast cancer and hot flushes. Support Care Cancer 2012;20:715-24. Walker EM, Rodriguez AI, Kohn B, Ball RM, Pegg J, Pocock JR, et al. Acupuncture versus venlafaxine for the management of vasomotor symptoms in patients with hormone receptor-positive breast cancer: A randomized controlled trial. J Clin Oncol 2010;28:634-40. Liljegren A, Gunnarsson P, Landgren BM, Robéus N, Johansson H, Rotstein S. Reducing vasomotor symptoms with acupuncture in breast cancer patients treated with adjuvant tamoxifen: A randomized controlled trial. Breast Cancer Res Treat 2012;135:791-8. Bokmand S, Flyger H. Acupuncture relieves menopausal discomfort in breast cancer patients: A prospective, double blinded, randomized study. Breast 2013;22:320-3. Nedstrand E, Wijma K, Wyon Y, Hammar M. Vasomotor symptoms decrease in women with breast cancer randomized to treatment with applied relaxation or electro-acupuncture: A preliminary study. Climacteric 2005;8:243-50. Davies F. The effect of acupuncture treatment on the incidence and severity of hot flushes experienced by women following treatment for breast cancer: A comparison of traditional and minimal acupuncture. Eur J Cancer 2001;37:S438. Bao T, Cai L, Snyder C, Betts K, Tarpinian K, Gould J, et al. Patient-reported outcomes in women with breast cancer enrolled in a dual-center, double-blind, randomized controlled trial assessing the effect of acupuncture in reducing aromatase inhibitor-induced musculoskeletal symptoms. Cancer 2014;120:381-9. Hervik J, Mjåland O. Long term follow up of breast cancer patients treated with acupuncture for hot flashes. Springerplus 2014;3:141. Nedstrand E, Wyon Y, Hammar M, Wijma K. Psychological well-being improves in women with breast cancer after treatment with applied relaxation or electro-acupuncturefor vasomotor symptom. J Psychosom Obstet Gynecol 2006;27:193-9. Frisk JW, Hammar ML, Ingvar M, Spetz Holm AC. How long do the effects of acupuncture on hot flashes persist in cancer patients? Support Care Cancer 2014;22:1409-15. Dodin S, Blanchet C, Marc I, Ernst E, Wu T, Vaillancourt C, et al. Acupuncture for menopausal hot flushes. Cochrane Libr 2013,7: CD007410. Dos Santos S, Hill N, Morgan A, Smith J, Thai C, Cheifetz O. Acupuncture for treating common side effects associated with breast cancer treatment: A systematic review. Med Acupunct 2010;22:81-97. Tao M, Shao H, Li C, Teng Y. Correlation between the modified Kupperman index and the menopause rating scale in Chinese women. Patient Prefer Adherence 2013;7:223-9. Borud EK, Alræk T, White A, Grimsgaard S. The acupuncture treatment for postmenopausal hot flushes (Acuflash) study: Traditional Chinese medicine diagnoses and acupuncture points used, and their relation to the treatment response. Acupunct Med 2009;27:101-8. Scheid V. Traditional Chinese medicine – what are we investigating? The case of menopause. Complement Ther Med 2007;15:54-68. Stener-Victorin E, Waldenström U, Andersson SA, Wikland M. Reduction of blood flow impedance in the uterine arteries of infertile women with electro-acupuncture. Hum Reprod 1996;11:1314-7. Huang R, Zhao J, Wu L, Dou C, Liu H, Weng Z, et al. Mechanisms underlying the analgesic effect of moxibustion on visceral pain in irritable bowel syndrome: A review. Evid Based Complement Alternat Med 2014;2014:895914. Spetz Holm AC, Frisk J, Hammar ML. Acupuncture as treatment of hot flashes and the possible role of calcitonin gene-related peptide. Evid Based Complement Alternat Med 2012;2012:579321. Pérez AL. Antagonism of tamoxifen and antidepressants among women with breast cancer 2011;139:89-99. Klein DJ, Thorn CF, Desta Z, Flockhart DA, Altman RB, Klein TE. PharmGKB summary: Tamoxifen pathway, pharmacokinetics. Pharmacogenet Genomics 2013;23:643-7. Cronin-Fenton DP, Damkier P, Lash TL. Metabolism and transport of tamoxifen in relation to its effectiveness: New perspectives on an ongoing controversy. Future Oncol 2014;10:107-22.